Their thick consistency is perfect for Oil type effects. They are quick drying and non-toxic, so they are perfect for use in the classroom. 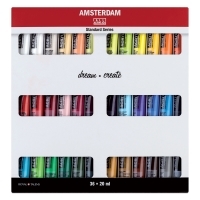 Set of 12 — A broader starting palette for the beginning painter, this set contains 12, 20 ml tubes including Azo Yellow Medium, Burnt Umber, Oxide Black, Permanent Blue Violet, Permanent Green Deep, Primary Cyan, Primary Yellow, Pyrrole Red, Titanium White, Ultramarine, Vermilion, and Yellow Ochre. 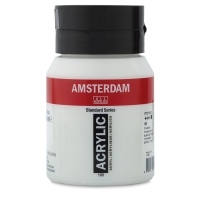 Set of 6 — If you want to give Amsterdam Standard Series Acrylics a try, this is the perfect set for you. It contains 6, 20 ml tubes including Oxide Black, Permanent Green Deep, Primary Yellow, Pyrrole Red, Titanium White and Ultramarine. 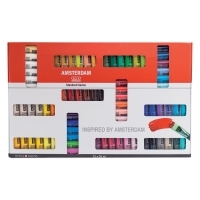 Dosing Nozzles, Package of 5 — These dosing nozzles fit both the 75 ml and 120 ml tubes of Amsterdam Acrylic Color, making it easy to paint directly from the tube. Each package contains 5 nozzles. Set of 36 — This set contains 3 tubes of Titanium White, and 1 each of Zinc White, Titanium Buff Deep, Naples Yellow Deep, Naples Yellow Red, Nickel Titanium Yellow, Greenish Yellow, Azo Yellow Lemon, Primary Yellow, Azo Yellow Medium, Azo Orange, Vermilion, Naphthol Red Medium, Pyrrole Red, Carmine, Primary Magenta, Persian Rose, Permanent Red Violet, Permanent Blue Violet, Ultramarine, Primary Cyan, Brilliant Blue, Sky Blue Light, Prussian Blue (Phthalo), Turquoise Blue, Yellow Green, Permanent Green Light, Permanent Green Deep, Olive Green Deep, Sap Green, Yellow Ochre, Raw Sienna, Burnt Sienna, Burnt Umber, Neutral Grey, and Oxide Black. Set of 72 — This set contains 3 tubes of Titanium White, and 1 each of Zinc White, Titanium Buff Light, Titanium Buff Deep, Naples Yellow Light, Naples Yellow Green, Naples Yellow Deep, Naples Yellow Red Light, Naples Yellow Red, Nickel Titanium Yellow, Greenish Yellow, Azo Yellow Lemon, Primary Yellow, Transparent Yellow Medium, Azo Yellow Medium, Azo Yellow Deep, Gold Yellow, Azo Orange, Vermilion, Naphthol Red Light, Naphthol Red Medium, Transparent Red Medium, Pyrrole Red, Naphthol Red Deep, Carmine, Primary Magenta, Permanent Red Purple, Quinacridone Rose, Venetian Rose, Persian Rose, Light Rose, Quinacridone Rose Light, Permanent Red Violet Light, Permanent Red Violet, Caput Mortuum Violet, Permanent Blue Violet, Ultramarine Violet, Ultramarine Violet Light, Grey Blue, Ultramarine, Cobalt Blue (Ultramarine), Primary Cyan, Phthalo Blue, Manganese Blue, Phthalo, King's Blue, Brilliant Blue, Sky Blue Light, Prussian Blue (Phthalo), Green Blue, Turquoise Blue, Turquoise Green, Yellow Green, Permanent Green Light, Emerald Green, Permanent Green Deep, Olive Green Light, Olive Green Deep, Sap Green, Yellow Ochre, Gold Ochre, Raw Sienna, Burnt Sienna, Burnt Umber, Vandyke Brown, Warm Grey, Neutral Grey, Lamp Black, and Oxide Black. Set of 24 — This set contains a nicely balanced selection of 24 colors, including Azo Yellow Lemon, Azo Yellow Medium, Brilliant Blue, Burnt Sienna, Burnt Umber, Carmine, Naples Yellow Deep, Naples Yellow Red, Oxide Black, Primary Cyan, Primary Magenta, Primary Yellow, Pyrrole Red, Permanent Blue Violet, Permanent Green Light, Permanent Green Deep, Permanent Red Violet, Sap Green, Titanium White, Turquoise Blue, Ultramarine, Vermilion, Yellowish Green, and Yellow Ochre in 20 ml tubes. This video shows the attributes and differences of both the Standard and Expert Series Amsterdam Acrylic Paints. Whatever level of acrylic painter, one of these paints is right for you.